Manhattan Beach home prices reached dizzying highs in 2015 across all segments of town, from the sand, to the trees, to the hills and across the highway to East Manhattan. 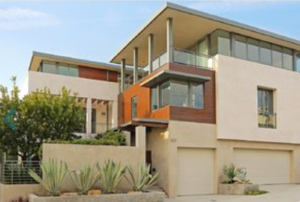 Manhattan Beach Confidential has catalogued all of the top sales of 2015 in a series of reports this week. The overall top sale was in the Sand Section, unsurprisingly, on the Strand. 304 The Strand made for a healthy lot sale/land bank with a sale in July at $14.000M. Among non-Strand Sand Section houses, 116 25th (5br/5ba, 5000 sqft. ), a splendid, newer modern with outstanding views and a Strand-adjacent midtown, walkstreet location, led the herd closing at $9.500M in July. The runner-up, by just a hair, was new construction at 205 20th (4br/6ba, 4750 sqft. ), which closed at $9.475M in July. Over in the Hill Section, 612 John (6br/8ba, 7400 sqft.) (pictured above) very nearly tripled in market value since its 2000 build. It closed for $9.400M in July (after having originally sold in $3.320M in 2000 and later trading hands for $5.400M in 2011). Runner-up honors went to 927 10th (5br/7ba, 5100 sqft. ), a "Plantation Contemporary" new construction. Even on a block with no view, the house's high style, all the bells and whistles, and a large 50 x 150 (7500 sqft.) lot, carried it to a pretty remarkable height: $5.800M in June. In the Tree Section, MB Confidential divides honors into Martyrs and non-Martyrs, with the American Martyrs neighborhood boasting close downtown access and, in many cases, ocean views. In the Martyrs division, views and location (plus an oversized 4200 sqft. lot) were the big draws for 621 13th (4br/5ba, 5650 sqft.) when it closed for $6.150M in May 2015. Among non-Martyrs contenders, 835 17th (6br/bba, 5900 sqft.) led the pack, closing at $4.780M in December. This house boasted an almost unheard of for the Tree Section 8000 sqft. lot. Over in East Manhattan, 1158 Longfellow, a 26K sqft. lot (more than a half acre) tucked away on the southeastern side of the hill, closed at $4.000M in June 2015. In second place was new construction 1131 6th (5br/5ba, 5025 sqft. ), built on a 7500 sqft. lot just a few doors down off of Sepulveda. It closed at $3.600M in Nov. 2015. Want the full scoop, plus the daily property ticker and more in-depth analysis? Visit Manhattan Beach Confidential.